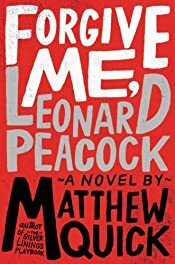 The Weinstein Company has optioned Matthew Quick's soon-to-be-published young adult novel of suspense Forgive Me, Leonard Peacock for film. James Ponsoldt has been tapped to direct his own adapted screenplay. Quick is probably best known for his debut novel, Silver Linings Playbook, the film adaptation of which garnered an Oscar earlier this year for Best Actress Jennifer Lawrence. Forgive Me, Leonard Peacock is published this August by Little, Brown. More about the book, below. In addition to the P-38, there are four gifts, one for each of my friends. I want to say good-bye to them properly. I want to give them each something to remember me by. To let them know I really cared about them and I'm sorry I couldn't be more than I was — that I couldn't stick around — and that what's going to happen today isn't their fault.